The Flexible Bolt Heater is designed for easier accessibility to tight, limited overhead clearances on bolts and studs. This heater can be bent up to 180 degrees or to any angle and back to a straight horizontal position without affecting performance. It is offered in a high watt density on the heated length of the flex rod, which is manufactured of stainless alloy which resists corrosion, rust and thermal fatigue. Each unit is tested at a rated voltage and electrically tested before shipment. Units heat up to operating temperatures in approximately 5 minutes. The flexible bolt heater can be ordered to any length and diameter (3/8” diameter or larger). Typical sizes include: .375”, .438”, .500”, .560”, .688”, .750”, .813”, .938”. If you do not see the size you need here, contact us and we will make it for you. 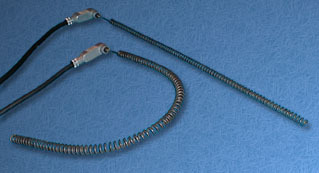 All flexible bolt heaters come complete with a 24” lead wire and optionally with a twist lock plug.